On Episode 8 of Lawyered, we’re speaking with animal rights lawyer, Camille Labchuk. Topics include: animal charter rights, dog liability and “humane-washing”. Camille Labchuk has worked to advance the interests of animals for over a decade. As a lawyer, Camille represents individuals and organizations in animal law cases, defends animal advocates, and seeks out litigation that enhances the interests of animals. 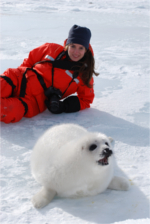 As an advocate, Camille’s work includes documenting the commercial seal kill on Canada’s East Coast, exposing cruelty in farming, and campaigns against trophy hunting, circuses, zoos, aquariums, shark finning, puppy mills, and more. She is a frequent lecturer and media commentator on animal issues.